While garage doors, as a general rule, require hardly any maintenance, paying it a little extra attention from time to time can go a long way towards keeping it in tip-top condition for longer. After all, if you think about all the valuable stuff people store in their garages – vehicles such as cars and motorbikes being just one example – it’s probably wise to make sure your garage door is functioning properly. It is recommended that you clean the exterior of your garage door twice a year using water and, if necessary, a mild household detergent. It doesn’t have to be complicated, simply wipe down and rinse. At the same time, ensure that your garage door is in good condition – wooden garage doors need to be checked for chipped or peeling paint and water damage, while steel garage doors need to be checked for damage and rust spots. Using a good quality aerosol lubricant or light oil, remember to lubricate moving parts such as hinges, springs and pulley bearings. Professionals recommend that you do this at least once a year, but do ask a garage door professional, exactly what you need to do for your specific garage door – you could be saving yourself a lot of unnecessary stress, time and money in the long term. If your car is always parked in your garage, chances are you open and shut your garage door several times a day. Be observant: watch out for loose parts or broken hardware, and listen out for any unusual noises – often, the first clue that something isn’t working properly with your garage door is the noise it makes when you open and shut it. Does it make grinding, creaking or scraping noises when in use? Does it move smoothly and easily? Noticing problems early and getting them fixed promptly is important in preventing the issue from getting worse. Depending on the severity of the problem, it’s a good idea to get a professional in to look at it instead of trying to DIY. Checking that your garage door is properly balanced, inspecting and replacing worn rollers, making sure that the weather strip seal at the bottom of the garage door is in good condition, testing of safety features, etc. 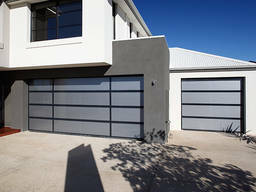 are all tasks that should be routinely carried out on your garage door. Engage a professional if you’re unfamiliar with garage door maintenance or simply don't have the time. Just a little effort really goes a long way so don’t skimp on its maintenance, keep your garage door in good and safe working condition always! Need a new garage door or the old one repaired find a garage door and other home improvement specialists near you on Homeimprovement2day.